You'd think that shooting someone square in the chest at point-blank range with a shotgun would put them out of the fight. And, for the most part, you'd be right, save horror movies and the 40k universe. That's just what happened to Kria Kytoro, but the House Escher alchymyst fleshteks weren't gonna let her go to waste. They made her stronger, faster, better, and she's hitting the battlefield again in her new form as Kria the Huntress. 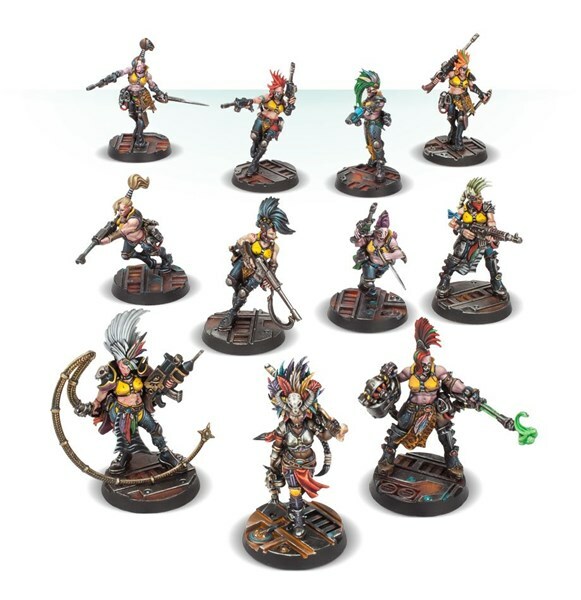 You can order yours for Necromunda from the Forge World webshop now. Kria Kytoro died with a sneer on her lips and her blade buried in her rival’s throat. Single-minded in her pursuit of her enemies, Kria earned the moniker of ‘Huntress’ because none prey-marked by her crew, the Bittersweet Blades, ever escaped for long. When Kria tangled with Gorgon, boss of the Irontree Lords, she met her match in ferocity and cunning, the Goliath leader emptying his shotgun into Kria’s chest even as her knife opened up his throat. Kria’s story might have ended there, had the alchymyst fleshteks of House Escher not already had their eye on her. Hauling her body from the Sump, the fleshteks began the process to turn Kria into a death-maiden, a resurrected warrior of House Escher. Kria proved an excellent subject, and within the cycle, she was hauling herself from an amniotic tank, her veins pulsing with chems. This multipart resin kit contains the components necessary to assemble Kria the Huntress, a Bounty Hunter available to House Escher gangs in games of Necromunda: Underhive. A shining example of the ostentatious flair characterising this gang, Kria wears tight flak armour, with metal shoulder pads, breastplate and knee pads offering protection from the travails of the underhive. 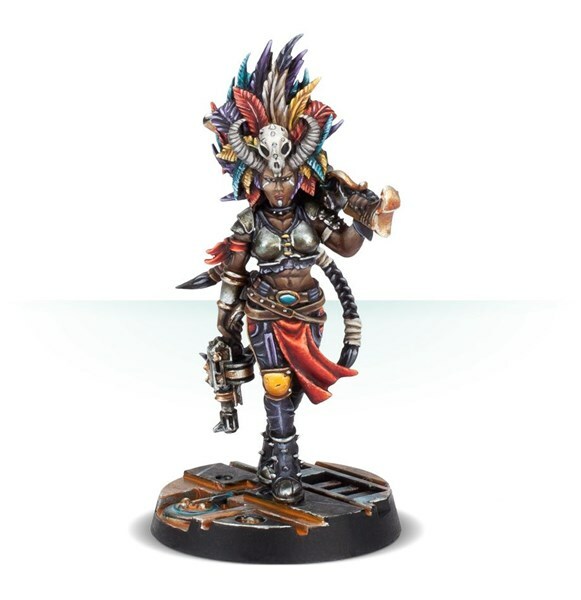 Her headdress is certainly eye-catching – featuring enormous curved horns, an animal skull (with extra studs) and a huge array of massive feathers, it makes Kria look even taller than her already-impressive stature. From the back, 3 thick plaits hang down to waist level; these are secured by thick webbing tied at the ends. Kria carries a pistol in her right hand, with a large rifle in her left, slung over her shoulder. Kria the Huntress comes as 7 resin components, and includes a 25mm Necromunda base. Rules for fielding Kria are included.